Today is Xian Yun’s birthday! Xian Yun and I both applied for single rooms for the 2016/2017 academic session in our hostel but failed to get them and ended up living together in a tiny double room. Somehow, we clicked really well and are each other’s favourite roommate to date. She is in the same school as me, School of Materials and Mineral Resources Engineering, but I’m a final year Mineral Resources Engineering undergraduate and she is a 3rd year Materials Engineering undergraduate. HOWEVER, we are the same age. Haha. Technically she’s older cause her birthday is in January and mine in March. How did I know her birthday? I asked about her birth month before cause I knew we were the same age but I wondered who was older. All the while I knew it was January, but I didn’t know which day. Honestly I assumed it would be mid-January. Just because. This morning, after my morning shower, I returned to the room and overheard one of the voice messages she received which says “Happy Birthday” in Cantonese. Then I was like is today her birthday? Still uncertain, I wanted to check her birthday on Facebook when I notice a message from Chia Ying, my schoolmate and Xian Yun’s senior. The messaged asked for our room number and that she (and some others) wanted to surprise her with a cake tonight. That was when I was certain that it was her birthday. So I told Chia Ying that I’ll just pretend I don’t know that it’s her birthday till they come tonight. My day was similar to yesterday, went to the library a little to study. I even had the same thing for lunch. In the afternoon WC and I had a meaningful discussion. I always take petty arguments as discussions as it ends up having values and leads to understanding each other better (I hope). I left the library pretty early today as the study materials were compiled and all that’s left was to memorise. 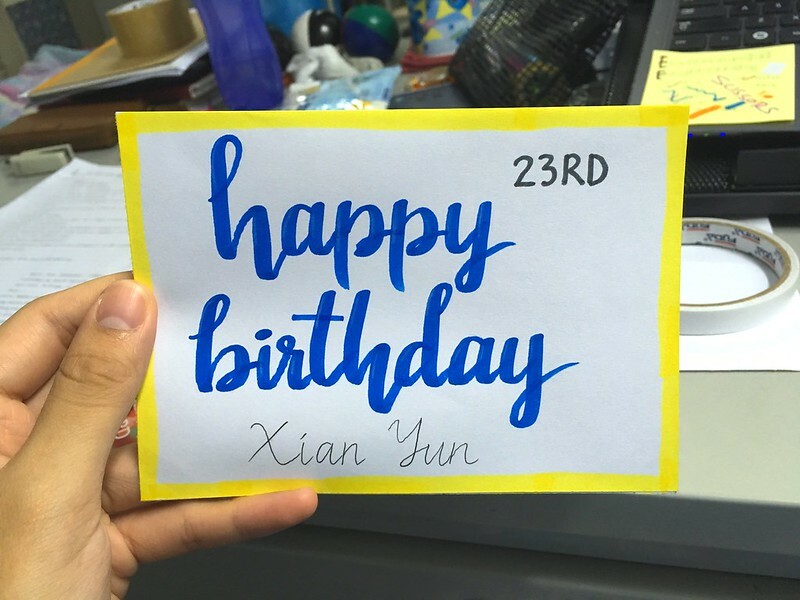 Well I also wanted to make a little birthday card for Xian Yun. This simple card took me more than 10 tries to get it close to perfect! Used the Crayola markers WC got for me for Christmas. I hope she likes it. The more I look at it, the more flaws I notice. Had KFC for dinner cause Xian Yun was there for take out after her exams. I had a loaded potato bowl, a piece of chicken breast and some fries, plus a cup of Pepsi, and not to mention 1.5 pieces of cake! Haha I’m so full right now still. Xian Yun bought 4 pieces of cake. It’s close to 10 PM now, WC is out with friends for a movie (Great Wall) and I gotta memorise them environmental engineering notes for the exam tomorrow morning. Also bought KTM tickets for a short trip home.